Today I’m going to help you trouble-shoot a couple of basic stitches. Nothing is more annoying than trying to sew something and having your stitches look like the sewing machine vomited them out. Whether your sewing machine is new or old, this should help you get started. I always suggest looking at the machine manual, since the manufacturer knows best! While there are LOTS of fancy stitches out there and special sewing machines, we are going to focus on the basics and using a basic sewing machine. No matter what kind of sewing machine you own, it will sew a straight stitch (well, as long as you feed in the fabric straight). This stitch does it all, from quilts to clothing to stuffed toys. The only change you can make to the straight stitch is the stitch length. In the image below, I have started off with a setting of 1 on the left. This means that each stitch should be 1mm long. Can you see the individual stitches?? They are teeny tiny. 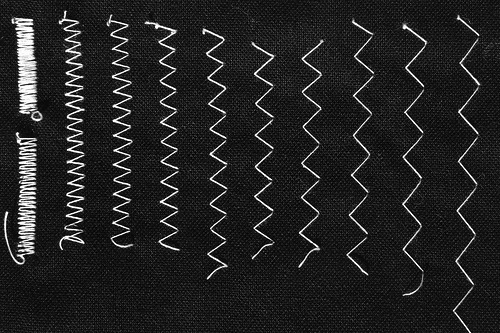 Each line increases the stitch length by 0.5, up to a stitch length of 5 on the far right. I always tell my student’s to sew mostly using the 2.5 to 3 range as if you are a beginner then mistakes can easily be unpicked. If you are foundation paper piecing, you may want to decrease your stitch length so that the paper tears away easier. Top stitching and quilting are usually done in the 3.0 to 3.5 range. Basting and gathering stitches are the longest, from 4.0 – 5.0. Play with your stitch length and see what settings you prefer, then write it down! Just remember you should not be sewing with tiny stitches less than 2.5 as they are difficult to unpick and you may damage your fabric if you need to unpick. The next basic stitch is the zig zag stitch. I admit that this stitch is my FAVORITE and I used it as a decorative stitch all the time! The zig zag has 2 options: stitch length and stitch width. Just like with the straight stitch, the stitch length is going to determine how far apart the stitches are. Above On the left you can see that I set my length to 0.3. The stitches are almost on top of each other. This is called a satin stitch and is used in appliqué to use this stitch you need to use an embroidery foot to allow the foot to glide over the stitches. Right below that line the stitch length is 0.5, so just slightly further apart. Moving to the right, you see a stitch length of 1. I increased my stitch length by 0.5 per row (I didn’t change the stitch width) up to that huge 5 on the right. When finishing the seams on clothing, I usually use a 2.5 stitch length instead of an over-locker. Above I’m changing the stitch width. The stitch width is how wide your zig zag will be. Again, starting small on the left with a 0.5, you can see that this creates a very narrow line, barely noticeable as a zig zag stitch . Moving across to the right I increased my stitch width by 0.5 and left the stitch length the same. Sewing Knits: If your machine is old and does not have a stretch stitch for knits then my tried and true stitch is a zigzag width of 2 length of 2. Always sew a test and see what works best on the basic I will be working with before I start a project. Play with all the combinations to find what works best for your project. I frequently use satin stitch for appliqué and top stitch with a zig zag and bind my quilts with it. I also use it to sew labels into my items. It’s much more forgiving that a straight stitch because the width of it catches more fabric and it’s harder to tell if the line isn’t perfectly straight. No matter what stitch you are sewing, it will look terrible if the tension if off. Some of the newer fancier machines automatically regulate tension, otherwise there is a knob or button. The best description I ever saw was that tension is like a tug of war between the top and bobbin threads. When they both pull with the same force you get a nice stitch and their numbers average out. Here you can see the bobbin thread sticking up onto the top. This means that the top is pulling too hard! Ease up guys, turn the knob to a lower number. Or sometimes the top gets lazy and the bobbin thread pulls it through. See the top thread showing through to the back? You need to kick the top thread into gear and raise the tension (higher number). Most sewing machines will have the standard tension marked with a dot or line. My machine averages out at 4, and I usually don’t have to adjust it too much from there. Skipped stitches are the worst. Below you can see an example of what skipped stitches look like in both straight and zig zag stitches. What causes these is that the needle is struggling to get through the fabric and doesn’t make all the way down to the bobbin. If you’re having this problem, CHANGE THE NEEDLE. It’s that simple. Your needle is either too dull (time for a new one), or not large enough to accommodate the thickness of fabric. Needles come in different sizes for a reason. While your small needle is great for sewing together thin cotton, once you start working with thicker materials or lots of layers, you need to get out a larger needle. Mis-threading the machine is also a problem that causes ugly stitches but is a simple fix. If you’ve played with the tension and still can’t get the stitches right, take out both the top and bobbin threads and start fresh. Your sewing machine should have little arrows that will point you in the right direction! Or use a q-tip to swab out the nooks and crannies. Canned air is a bad idea because it just blows the dust further in. Blowing into the machine yourself is a no no as it creates moisture and can cause rust. Use your machine table or buy an extension table if your machine does not have one. This is essential so you are working ergonomically and your work is supported.